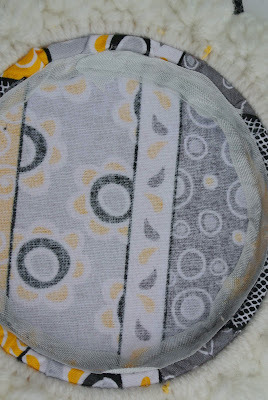 Yep, it's another Diapers to Go diaper and wipe carrier baby gift. This is by far, my all-time favorite gift to sew for new mommys. The lovely recipient of this one already has a girl version that I made for her several years ago. 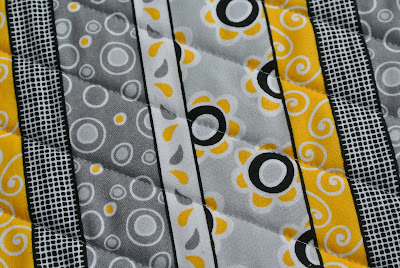 She is expecting a little boy this time, so I chose the gray, yellow, and black theme. 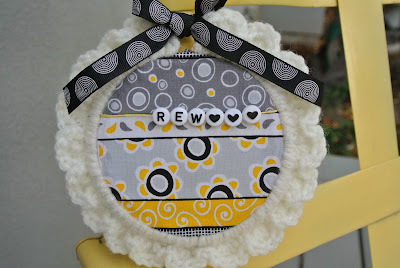 I also added a cute little embroidery hoop wall hanging embellished with her new son's initials. He is REW III, that's why I added the three little hearts after his initials. Some shell stitch crochet around a wooden embroidery hoop adds a sweet frame to the hooped fabric. The raw edges of the hooped fabric on the back side are completely covered. Hug Snug rayon seam binding was the perfect finishing touch. 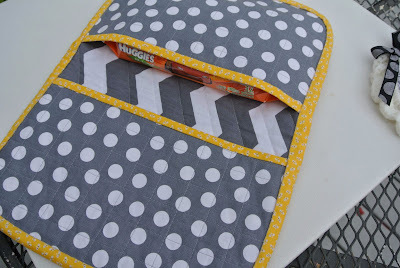 The walking foot was perfect for quilting straight lines across the outer shell of the diaper carrier. But when it came to the inner pockets . . . 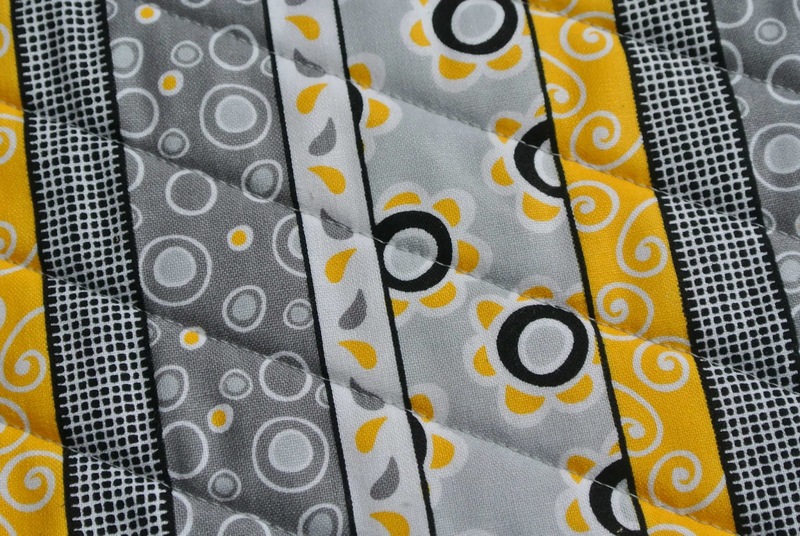 I decided to experiment with some quilting. The left polka dot pocket panel has a square grid quilted on it. The right side is quilted with a feather pattern. Hmmmmm, no synergy between the geometric grid quilting and the feather quilting. 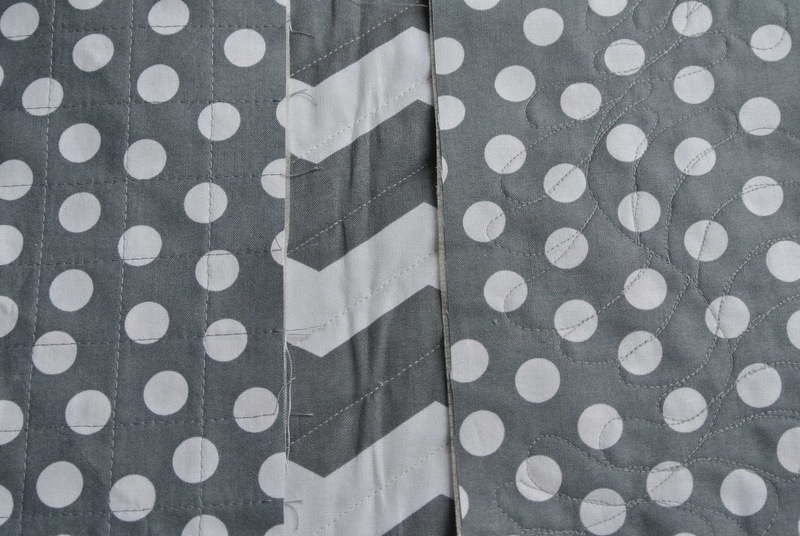 I opted to quilt both sides with the square grid pattern. If you're looking for a fun, quick, and very much appreciated baby gift, this one fits the bill. Before this young mom knew I would be making a second one for her, she actually asked if she could purchase one from me. I reassured her that I already planned to gift her with a new one. It's nice to know she really liked the first one. I have a new home dec item to share with you as soon as I get it photographed. Until then . . .